AFRICA = NEXT US TARGET FOR NATURAL RESOURCES + CHEAP LABOR | Concise Politics -- Your Time should NOT be wasted. Oil-Grabbing Trojan Horse by MULTINATIONALS In Africa = AFRICOM = US Africa Command = Active in region for MANY YEARS! AFRICOM = Rapidly expanded presence in African = Began towards END of Bush administration = “defense, diplomacy, and development.” = Coordinating “ low-cost, small-footprint operations” throughout the African continent. AFRICOM = Military attempts a friendly face on its expeditions in Africa. = Eric Schmitt wrote glowingly about fighting terrorism with mosquito nets…“American boxes of donated vitamins, prenatal medicines, and mosquito netting to combat malaria.” = Public relations campaign. AFRICOM = DRONE STAGING GROUND = Operation Flintlock = Just one of the many training exercises + Camp Lemonnier in Djibouti is a well-known staging ground for drone strikes in Yemen and Somalia. AFRICOM = Trains Ghanaian troops + Conducts humanitarian missions + Meets with local chiefs + NGOs + Fishing communities. AFRICOM = Daily operations and talk of “ sensitizing” West African nations to the idea of a permanent Marines “crisis unit” in the region make clear that a more permanent U.S. presence on the continent is its true intention. AFRICOM = “DISASTER MILITARISM” = “Humanitarian projects? ?” = Activists with Women for Genuine Security explain this use of humanitarian aid to “ further larger geopolitical and military goals”—a practice they have dubbed “disaster militarism”—is a general strategy employed by the U.S. military worldwide. AFRICOM = PART of US military’s “lily pad strategy” of speckling the globe with tiny military installations = “small-footprint operations” = small-scale troop build-ups to establish grounds for larger concentrations of troop activities later on. AFRICA = NEXT US HIT! UPDATE: Will Obama Fall Victim to ‘Creeping Interventionism’ in Nigeria? Boko Haram = Vicious, destructive group led by a person who is probably insane. So far Obama = judiciously offered surveillance assistance and other limited help to the Nigerian government and insisting that “ransom payments and other concessions” are unthinkable. = A danger of a kind of “creeping interventionism” that Obama must resist. = Obama addressed the limits of power for US in situations like this =”there are times in which I want to reach out and save those kids—and having to think through what levers, what power do we have at any given moment?” = Obama offered limited help = Surveillance flights over Nigeria in the search for more than 250 abducted schoolgirls and is considering the deployment of drones to the region to bolster the effort, officials said Monday. US Army’s Africa = Preparing to send soldiers and special operations forces to Nigeria to train that nation’s forces for combat operations, a first for the command that traditionally has trained local forces for only peacekeeping missions. = Team will arrive in Nigeria to train a newly formed 650-man Ranger battalion by the end of May to fight Boko Haram. Obama has to resist the idea that the US and its military can solve it. OBAMA STATE OF UNION 2014 = Across Africa = Businesses help end extreme poverty (LOL – NEXT SLAVE LABOR TO EXPLOIT) = We believe in the dignity and equality of every human being, regardless of race or religion, creed or sexual orientation. Kerry = Africa has “Natural Resources” = US is a “Natural Partner” + US “know-how for economic development” = AP reported what Kerry said to Addis Ababa diplomatic corps + Young Africa leader network following his visit to Ethiopia. Kerry said over next 3 years 37 of 54 African nations will hold national elections. He called on Africans to combat corruption costing the Africans $10s of Billions. = US wants to SCAM $100s of Billions. = Kerry highlighted Nigeria + South Sudan + Somalia + Central African Republic = Urged Africans to demand stability and financial development. Equatorial Guinea = Lots of natural resources = Uganda + Rwanda + Ethiopia = Kerry called on all Africans to combat the corruption. Africa = Increasingly important for our EU NATO allies worried about loss of economic and political influence from instability. USUAL BS = Security threats + terrorism + illegal immigration + human smuggling and trafficking + drugs + arms trafficking. = WE’VE GOT TO ROB THEIR RESOURCES! = The African continents energy and strategic mineral reserves are also of growing significance to China + other countries. = Provides opportunities for US objectives. = Africa is Washington’s next colonial project. = Expand AFRICOM and more drone bases as US + EU Continue Colonizing Africa (for centuries) + Local Dictators WILL BECOME $BILLIONAIRES. NIGERIA FRAUD = Goodluck Jonathan presidential panel says privatize 4 PUBLICLY OWNED refineries for PRIVATIZED RIPOFF. = In Name of efficiency. Kalu Idika Kalu-led taskforce = Recommended sale of GOV ’s pipelines and depots. On 9 December 2005, Jonathan was sworn in as Governor of Bayelsa State upon the impeachment of the current Governor charged with money laundering in UK. In September 2006, Jonathan was marred by indictment of his wife for crimes related to money laundering. 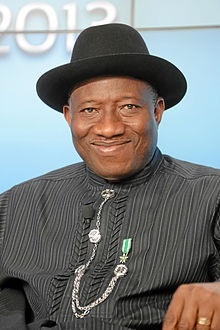 Goodluck Jonathan = Attempted to remove the people’s fuel subsidy 2011 to 2012 = 80% of Nigerians opposed = Many prominent Nigerians spoke out against the removal of subsidy by Jonathan administration. = Will squeeze the economy, increase inflation, and hurt both businesses and the public. = The Nigeria Labor Congress’ warning of many strikes by unions = Called for Jonathan to resign = After 5 days of national protests and strikes Jonathan announced the pump price would be 97 naira/litre (NOT 147 naira) = Subsidies Kept = BUT THEN HE TRIES TO PRIVATIZE HIS FRAUD. President Jonathan accused of masterminding 1 October 2010 independence day bomb attacks. = Organized in a desperate political strategy to demonize political opponents and win popular sympathy ahead of the 2011 elections. = The Nigerian Presidency denied the allegations of terrorism leveled against President Jonathan. This entry was posted in AFRICA = NEXT US TARGET FOR NATURAL RESOURCES + CHEAP LABOR and tagged AFRICA = NEXT US TARGET FOR NATURAL RESOURCES + CHEAP LABOR. Bookmark the permalink. ← SMELL OF GOP WHEELS SPINNING ROUND IN CIRCLES = GOT TO LOVE IT!